And what seemingly has become a typical occurrence for getting anywhere at a decent time from thee Pacific Northwest, once again I was fated taking another Oh DARK 30 flight, this time departing at 7AM, with my Shuttle arriving at 4AM after having abruptly awoken at 2:45AM; SHEISA! Upon having been safely collected by my hosts Claudio' & Nelie, and with their friends (Larry & Karen) from North Carolina in town, we all inserted ourselves into the mighty CRV and trundled off towards Lockhart in search of the apparently world famous Black's Barbeque restaurante established in 1932, which Karen had seen multiple times upon the Travel Channel. There we had some fine eats as in brisquet Y'all! Not to mention ribs, "Snazages" (Sausage) and beef to name just a few of their tender morsels, not to mention the plethora of side dishes... But Don't worry Y'all, there weren't NOBODY named Barrack trying to cut ahead in our buffet line; Hooah! Spending Thursday leisurely, I mused that evening that it was just another typical day in Austin; Hya! First having been rear ended by some speedy Toyota Camry whose entire grill, front facia and hood were smashed-in upon clobbering our CRV's rear mounted spare tyre. As our heads were thrust harshly into the seatback as we were trying to pull out into traffic. Then as we exited the 'Regal Beagle cinema where we'd gone to purchase tickets for the special screening of Clockwork Angels, Claudio said that's funny, there's a "Copper" next to our car... And upon entering our vehicle I asked Claudio if he'd rolled up my window? Then in the middle of the spacious parking lot he came to an abrupt halt and said what's this on my window? It was a note from APD (Austin Police Department) saying windows down, key in ignition; you're asking for I-T! Informing us they'd rolled up our windows; Aye Karumba! then upon the way to the local Colver's restaurante, as our guests had informed us they've got the bestest cheese burgers & frozen custard; Somebody Give Me a cheeseburger; Hooah! We passed by a local climbing wall with a flotilla of Austin Fire Dept vehicles parked in front of it, as they were busy practicing their repelling techniques; Yep! Just another typical day in Austin, right? Hooah! 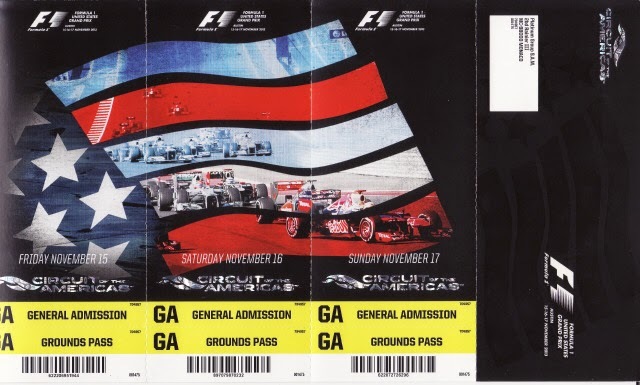 To continue reading, see; USGP: Vettel Rustles UpAnother Record at Austin's 2013 F1 Race - Fini!